JHP Fasteners is proud to represent International Welding Technologies’ (IWT) fasteners and equipment. IWT is a cutting edge manufacturer of American made stud welding equipment and fasteners combined with boundless application knowledge. They also stock replacement parts to suit other manufacturers’ CD and Arc stud welding equipment. If you need consumable parts for your particular stud welder, please contact us directly and we’ll be happy to find it for you. American Made Flexible Performance. 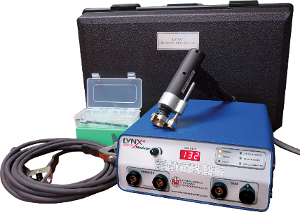 What are some features of an IWT LYNX stud welder? What is Capacitor Discharge Stud Welding? CD stud welding is often use in situations where putting a hole in the sheet metal (as is used for self-clinching fasteners) is not an option. This usually goes hand in hand with the sheet being required to maintain a blemish free show surface opposite the studded side. Since we have very precise control of the time, current & pressure being used to create the weld, we can often eliminate or reduce greatly any cosmetic damage to the show side of the sheet metal. With an IWT LYNX stud welding system, you can also weld CD standoffs or “tapped pads”as they are known within the industry. These tapped pads use female threads which give you the opportunity to hold one piece of material apart from another at a specific distance and in a secure manner. Both CD studs and tapped pads are often found in a variety of everyday products such as signs & displays, elevators, gaming machines (slot machines, etc…), furniture, automobiles and many more. Through IWT, JHP Fasteners can offer a wide array of specialty CD stud welding equipment to suit your individual needs. Using state of the art motion controllers, IWT’s CNC welding cells can position fasteners within a thousandths of an inch on a workpiece insuring that every CD stud gets welded in the exact spot every time. No more time consuming jigs & fixtures. These CNC stud welders are flexible enough for a low-medium volume production job shop or they can be crafted to bring speed and efficiency to your high volume assembly line. We invite you to take advantage of JHP Fastener’s broad range of industry experience and expertise. We have 40 years of experience in the industrial fastener market, and are intimately knowledgeable in all associated products and equipment. We will take the time to understand your specific requirements and will work hard to provide you with appropriate guidance and advice. We will also ensure that you receive competitive pricing on all of your purchases. Contact us for any industrial fastener requirement you may have. We will work hard to win your business!